GLNC is the independent authority on the nutrition and health benefits of grains and legumes. GLNC is a not-for-profit company limited by guarantee and a recognised health promotion charity. As the independent authority on the nutrition and health benefits of grains and legumes, GLNC provides a platform for organisations from across the grains and legumes value chain that have a pre-competitive interest in promoting the health and nutrition benefits of grains, grain-based foods and legumes. As the independent authority on the nutrition and health benefits of grains and legumes, GLNC’s mission is to promote grains and legumes nutrition as part of a balanced diet through evidence-based information cultivating good health. 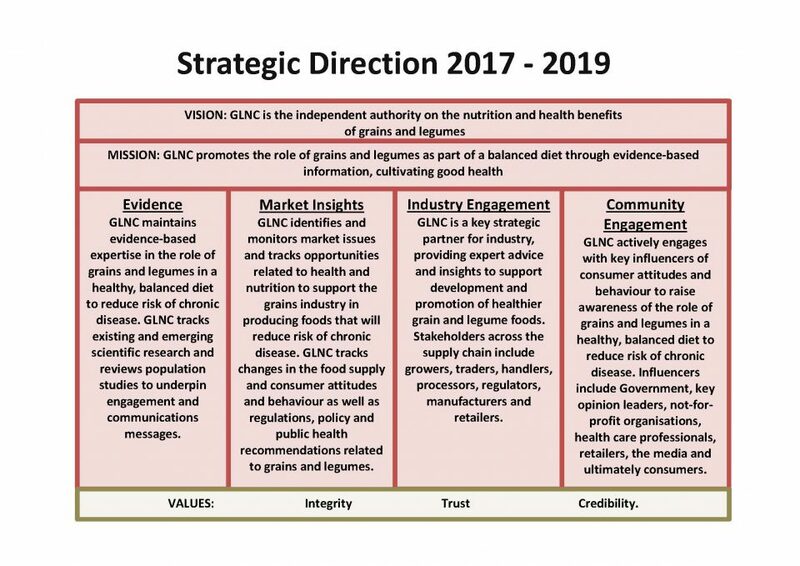 GLNC proactively communicates and engages key stakeholders on the nutrition and health benefits of grains and legumes to drive greater awareness, build trust and integrity through evidence-based science. Stakeholders include Government, key opinion leaders, food industry, academia, scientific and nutrition community including health care professionals, media, and ultimately consumers. Maintenance of a credible and evidence-based scientific database and internal expertise that support grains and legumes nutrition including health and disease outcomes. GLNC reviews existing, and invests in new, scientific research and food processing analysis to monitor current and emerging trends. GLNC actively develops and responds to public health policy and regulatory issues to ensure grains and legumes nutrition is independently and scientifically represented on issues of significance.